If you are a pool owner, you know how much cleaning and maintenance is needed to keep it looking good, and frequent vacuuming is one of the simplest ways to make your facility sparkle. Actually, it is the best way to clean your swimming pool, besides getting a professional to do it for you. To ensure you vacuum effectively, you will need the best pool vacuum heads to attach to your vacuum cleaner. Getting the best models can be a tiring experience considering the many brands on the market today. Luckily, I have compiled an article that looks at pool vacuum head…let’s ride together as we look at vacuum heads for 2019. Below is a review of the top vacuum heads on the market today. The Milliard 14 Inches Pool Vacuum Head comes with a handle adapter that you can attach to standard extension poles. It also features spring-locking clips that are easy to remove and even adjust to align with the pole. 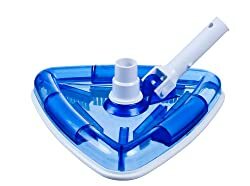 Moreover, the head is made of the flexible plastic surface that curves to your pool’s floor to maintain steady suction on the surface being cleaned. Sufficient weight keeps your vacuum head submerged at the bottom and free-moving wheels prevent it from scraping or scratching on delicate pool areas. Another feature of this vacuum head is the 1½ inches suction port for connecting. And it is made of strong ABS plastic material that lasts longer and is extremely durable. The unit is ideal for cleaning floors of up to 14 inches. With this unit, you will get value for your money and have an easy time cleaning. The second product also comes from Millard and it has a handle that comes with locking clips that are fitted with a spring. This makes it perfect for attaching to standard poles and its vacuum port fits 1¼ and 1½ inches standard vacuum hoses. Its triangular plastic body is made of transparent material to ensure that you easily see through when maneuvering it. Hence, you are guaranteed of accurate vacuuming into corners and along walls for a more thorough cleaning. Just like the 14 inches model, this model has sufficient weight to keep it at the bottom of your pool where it’s meant to clean. Instead of wheels, this vacuum head comes with rubber bumpers that prevent scraping or scratching of your pool liner. 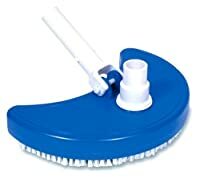 This model is able to clean an area of 11 inches and it has ABS plastic that makes it durable and resistant to pool chemicals. Millard is a leading brand when it comes to the manufacturing of vacuum heads. This time they have the Extra-Wide model that comes with an aluminum handle adapter that easily attaches to most extension poles. It also features spring-loaded locking clips. Its super-flexible and durable plastic body curves to your pool surface to ensure that the right suction is maintained when cleaning your pool. It is also weighty to ensure that it remains grounded to the pool surface and do its work as it was meant to. This model comes with free-moving molded urethane wheels that prevent it from scraping or scratching delicate parts of your pool and offer an amazingly smooth glide. The model is also made of ABS plastic material that adds to its longevity and durability. And it is able to clean a wide area of 19 inches. The U.S. 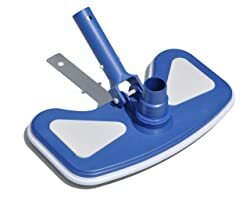 Pool Supply Flexible Vacuum Head is a 12 inches wide head that is able to clean sufficient area of your pool. It is weighted to ensure that it remains on the surface and it connects to standard 1½ and 1¼ inches vacuum hose. It is an easy to navigate spas and pool vacuum head due to the flexible body. 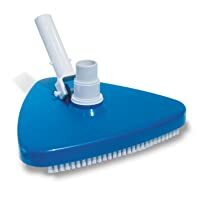 Moreover, it comes with long-lasting nylon bristles that easily clean slopes, corners, and walls. The head is able to maneuver through tight areas and corners to clean every part of your pool. Furthermore, its handle features EZ clips that enable you to easily, quickly, and safely connect and disconnect to 1¼ inches telescopic poles. It also comes with a one year warranty, hence, be sure to have a 100% satisfaction and buy this product with confidence. 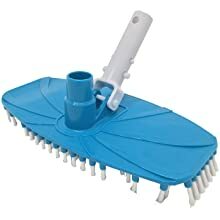 Swimline HydroTools is a great weighted vacuum head that makes swimming pool cleaning easy. This model was designed for cleaning vinyl-lined and fiberglass pools since it comes with unique features for protecting them. 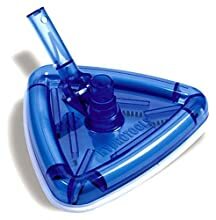 And its triangular design makes it perfect for cleaning swimming pool corners effectively. No matter how your pool looks, this vacuum heads with clean it and provide you with a pool that you can swim any time you want. Another feature that makes it an effective model is the angled brushes that provide quick pick-up of dirt and other debris. Furthermore, the vacuum head fits well in all standard 1½ and 1¼ inches vacuum hoses. And it has a snap-adapt handle that makes it easy to assemble. So, if you want to get value for your money, this is the model to buy. Just like all other vacuum heads from Milliard, this model comes with a handle that has locking clips loaded with spring. 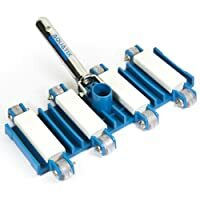 This enables it to attach easily to all extension poles and make your cleaning task easier. This model also features air-relief valves that release excess suction and is weighted to enable it to remain on your pool floor. The air-relief valves come in handy to prevent accidental damage to the liners and stress on the filter pump. Moreover, the unit is compatible with both 1½ and 1¼ inches vacuum hoses. The other notable feature of the head is ABS plastic material that enables it to last longer and remains durable. 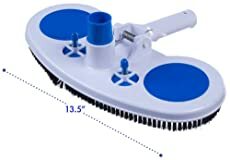 This head is able to clean 13 inches of your pool at a go, making it easier and faster to clean your pool. It also comes with perimeter vinyl swimming pool safe brushes that help to loosen algae. Aquatix Pro is able to clean all kinds of pools effortlessly. This ensures that your swimming pool is left clean using a convenient, fast and simple process. Weighted construction makes sure that it sticks to the surface and cover more ground. Moreover, the unit is able to clean all the corners due to its premium and professional grade design. Also, it is easily compatible with standard telescopic poles as well as pool vacuum pipes and hoses. The other feature of this head is the long lasting and strong wheels which make it easier to maneuver. It also comes with the aluminum handle as well as flexible EX clips for an efficient and fast finish. And that’s not all, you are guaranteed satisfaction for one year. Therefore, you can be assured of having a top quality product that will last for years. HydroTools Vacuum Head comes with a 1.5-pound weight that keeps it settled on your swimming pool surface. This makes cleaning your pool easier than having other heads that are not weighted. The model is compatible with 1½ and 1¼ inches vacuum hose. Hence, its universal fit makes it perfect for use with different hoses and its quick snap pole adapter attaches to 99 percent of vacuum poles. The best part, replaceable brushes are always available to ensure that you use your vacuum head for long. A great thing about this head is that it’s designed for all swimming pools. So, no matter your pool size or type, this is the model for you. And it will provide many years of services since it’s made of high-quality material. If you want a product that will be able to remove debris from your vinyl liner pool, then this is the model for you. Actually, it is able to clean your swimming pool within minutes to leave it spotlessly clean and offer a safe place for swimming. The model is well-weighted for easy surface maneuverability without damaging the surface. Thus, you get a product that is able to clean your pool easily and maneuver it around the surface effectively. 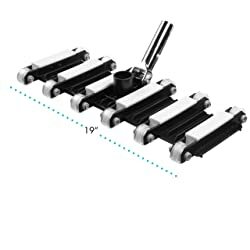 Another notable feature of this unit is the replaceable perimeter brushes that are made of long-lasting polypropylene material. And you can also replace the brushes when they get worn out. Moreover, the vacuum head can be used with standard pool poles and vacuum hose. 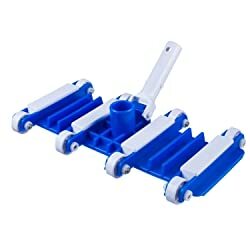 It is able to clean a wide surface of 10-3/8 inches. Last, but not least, is the Swimline HydroTools that comes with a weighted butterfly head to ensure that it remains on the surface when cleaning. It also comes with easy push button for on/off connection and disconnection of the telescopic poles. And it fits both the 1½ and 1¼ inches vacuum hoses, making it a universal product that will offer value for your money. Ease-adapt handle easily fits standard 1.125 inches poles and it measures 11 x 55 inches. When it comes to the material, the model is made of nylon/plastic bristles that clean your pool thoroughly. This material lasts for long and it comes with a lasting construction. With this model, cleaning your pool can never be easier than this. The width can vary from 14 – 40 inches, depending on the model. A wider head will cover more ground in a single pass. However, an increased width means an increased drag. So, know the physical ability of the person who will be using the vacuum head before you buy it. Also, consider your storage area before you settle for a specific model. Vacuum heads come with a lot of wheels located on the underside. The best models feature wheels with ball bearings to make them move easier. The rolling motion of these gears reduces friction and enables the wheels to move more smoothly. If you go for a large head, ensure that it has ball bearings to make it easier to drag in your pool. Wheels with ball bearings are usually durable since they bear the weight and reduce friction. Hence, they tend to wear slowly. It is important you consider the design of the pool vacuum head before you purchase one. For instance, if your pool has a lot of curves, choose a model that comes in a triangular design. This design will make it easier to clean all parts of your pool. Q: How do I connect my vacuum head? A: No matter how hard it might seem, it is actually very easy to connect a vacuum head. First, you should connect the extension poles or long pole to your vacuum head. Then, you should attach one side of the hose to your vacuum head. Q: How can I use my pool vacuum head? A: Once you have assembled your unit, you need to slide it on your swimming pool walls and floors to remove and collect debris and dirt. However, you should be careful when handling huge collections of debris and leaves since they can easily clog your machine. Selection of the best pool vacuum heads for commercial or private use might seem a daunting task but it is very easy. All you need to do is to follow the information I have provided above and you will surely get a model that will not only suit your needs but also be budget friendly. Hit the market and get the model that satisfies your taste and preference.